As someone who is a bit more decoratively inclined my thoughts usually tend to follow a different track, but the other night I was up late and looking for a bite to eat and stopped in at the Waffle House. While waiting for my eggs and gazing out the window my eye was caught by the ubiquitous sign and it immediately struck me what a perfect example of the concept of a monospaced font it is. 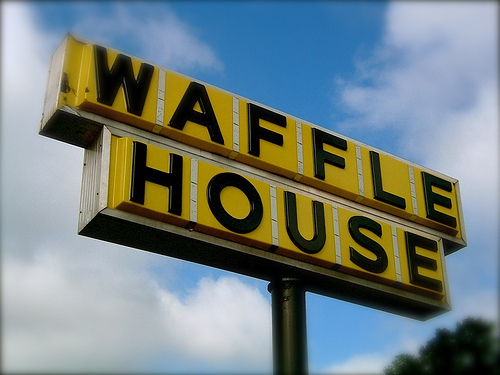 The Waffle House sign is made up of a series of perfectly regular squared with characters inside them and the characters are uniform in width and height, illustrating very clearly the relationship between a character and the space it occupies, as well as showing how characters can be made to look relatively normal while having a uniform height and width. We have some interesting monospaced fonts, including Onuava and Cincinnatus which are two of our most popular. We actually have one which has the one-to-one height to width ratio, but Big Block doesn’t look much like the Waffle House font.